Wedding plans in your future? For an intimate, romantic honeymoon cruise, join us aboard Diminuendo. Many wedding venues in Northwest Washington are located on the waterfront and several have docks available were we can whisk you away on your honeymoon following your wedding and reception; picture your own Pacific Northwest wedding cruise. Imagine Diminuendo’s captain officiating your nuptials while your family and friends gather in witness of the big event from shore. Just a few steps away are several banquet facilities where you can have your reception. 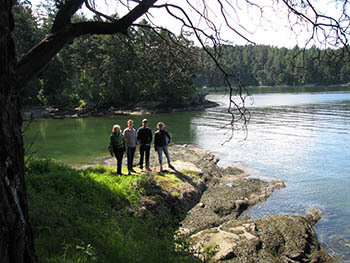 Following the reception, you again board Diminuendo and set out on your honeymoon cruise around the San Juan Islands while your guests give you a grand send-off. Mari works closely with wedding planners and venues, or let her apply her catering experience and knowledge in event planning to organize an entire wedding for you. 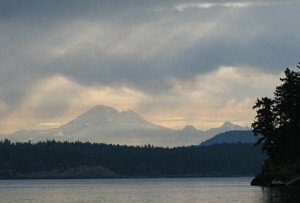 Celebrate your anniversary by escaping on a second honeymoon San Juan Island sailboat cruise with your sweetheart. Not married yet? Imagine yourself on bent knee on a remote beach while the sun glints on the ring she’ll treasure forever. Mark the passing of a loved one with a memorial at sea. In life, they had a love affair with the sea. Let the departed become one with the sea by scattering their ashes to the wind and waves. Share your fondest memories of the departed with their closest family and friends on the healing waters. Reunite with Mom and Dad or your favorite aunt, uncle, and cousin for a week you’ll never forget. The kids will love sharing the pullman berths in their own private cabin. Get together with your old college or high school buddies and compare your hair-lines and waist-lines! Escape the holiday crowds in style aboard Diminuendo! You’ll be amazed how peaceful and tranquil the islands are when the highways, parks, and campgrounds are overrun with holiday revelers. Show Mom how much you love her by treating her to a dream holiday cruise. Mom brought you into this world. She nurtured you and cared for you. She wiped away your tears and hugged you like only a mother can. Allow the crew of Diminuendo to pamper her for a few days to show your appreciation for all she does. She’ll love the quiet of gliding along under sail and sleeping in a quiet cove. Mother’s Day is celebrated the 2nd Sunday in May. What can we say about Dad? He is your rock. He has steered you down the right path when you may have strayed. He always stood at the helm in your life, now let him take the helm of a yacht for a few days. Father’s Day is celebrated the 3rd Sunday in June. Memorial Day is a time to show our appreciation for those who paid the ultimate price while serving our country. The islands provide the perfect setting for quiet reflection. Memorial Day is celebrated the last Monday in May. 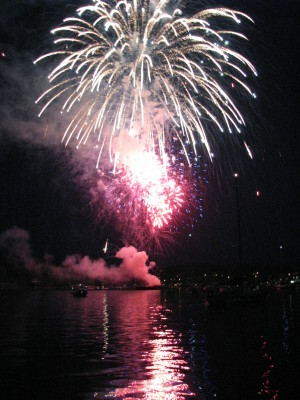 Celebrate Independence Day at anchor in Friday Harbor, where you will have the best view possible for the wonderful fireworks display. You’ll be amazed how un-crowded and peaceful the islands are. Independence Day is celebrated on July 4th. Labor Day commemorates the working people, people like you who toil to make a better life for yourself and provide for your family. Summer may be winding down as fall approaches, but people who live here know that September is usually the most beautiful time of year in the Pacific Northwest. Labor Day is celebrated on the 1st Monday in September. More experienced guests may prefer a bare-boat charter. We are happy to offer Diminuendo for your use. Please call for rates. Give us a call or drop us an email to check availability. Refer to our rates page for prices and our latest specials.